HIGH avalanche danger remains in the upper elevation terrain in the Girdwood Valley, Portage Valley and the Kenai Mountains (including Turnagian Pass). Large slab avalanches are expected to occur naturally and debris could run to valley floors. In the mid and lower elevations, a CONSIDERABLE avalanche danger exists where naturally occurring slab avalanches are possible. Travel is not recommended in avalanche terrain. The main storm has passed, but human triggered avalanches will remain likely today. Should you decide to check out the conditions keep slope angles less than 30 degrees and steer clear of gullies and the bottom of large and steep slopes in the event an avalanche occurs above you. Finally, a potent wet, warm and windy storm to help build our snowpack and hopefully clean out the many weak layers that have developed this season. Over the last 48-hours we have seen 2-4+ inches of rain fall below 1,000' and 2-4+ feet of snow fall at the upper elevations. The peak of this storm was 24 hours ago (early yesterday morning) and with this was a widespread natural avalanche cycle. Although the storm is winding down, along with the naturally occurring avalanche cycle, there still exists the possibility for very big avalanches to occur today and human triggered avalanches are likely. That said, today is another day to leave the mountains alone and let them do their business. We should see one more pulse of wind and precipitation come in later this morning (20-25mph Easterly ridgetop winds and .2" of rain below 500' and 2-4" snow above 500'). Temperatures will remain warm and this is a big factor keeping the mountains unstable currently. At the upper elevations were drier snow is falling and winds are blowing, wind slab and storm slab avalanches are likely. Debris from these could run into the mid and lower elevation bands. Additionally, at the mid and lower elevations the new moist/wet snow is still adding stress to the underlying weak snow and post storm large avalanches lower on slopes are possible. 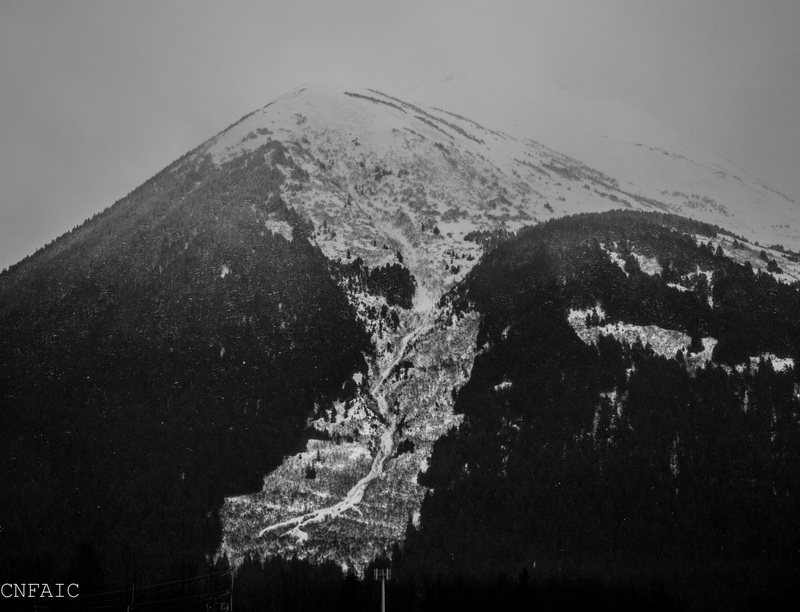 Photo: Large avalanche triggered by avalanche reduction work just South of Girdwood. You can see the wide propagation and various bed surfaces in the crown where the avalanche released. Visibility was limited on Turnagain Pass, but we did get a look a this new debris pile on the South end of Seattle Ridge. Video below is from avalanche reduction work conducted by the AKDOT & PF Avalanche Program along the Seward Highway between Bird and Girdwood. Many areas in the region have a variety of weak layers in the mid and lower portions of the snowpack. The warm temperatures and additional load from this storm has been overloading these weak layers and we are seeing avalanches break near the ground. This is occurring mainly in thin snowpack zones such as Girdwood Valley, Summit Lake and the interior Kenai Mountains. The South end of Turnagain Pass is also suspect for these large slides breaking near the ground. Hopefully visibility will be good enough today to see what has occurred in these zones. Photo: It's a bit difficult to see but this is a natural avalanche breaking near the ground yesterday on Orca with debris running in the middle of the trim line. Orca can be seen easily from the Tesoro gas station in Girdwood. Below 1,000' the snowpack is saturated due to 1-3" of rain that fell during the past 36 hours. Wet slab avalanches were occurring naturally yesterday and though the peak of the avalanche cycle is winding down, they are still expected again today with continued above freezing temperatures and .2" of rain forecast. Photo below: Slab avalanche triggered by rain and very wet snow between 800' and 1300' on lower Wolverine Ridge. There are likely more of these, but visibility was limited to only a few portions of terrain. NOTE: You can see the rain/snow line by the dark trees at the bottom of photo and white(ish) trees at the top. Yesterday's wet and warm storm diminished during the day and precipitation and winds have backed off overnight. Girdwood Valley saw 1.6" of rain while Turnagain Pass had 1.3". The rain/snow line was around 1,000' and has lowered to around 700' this morning. Ridgetop winds peaked 24 hours ago in the 40's mph with gusts into the 70's from the East. Temperatures were warm, 40F at sea level and 32F at 1,000' with ridgetops in the mid 20'sF. Today, we should see mostly cloudy skies with another quick shot of precipitation, 0.2" of rain below 500' and 2-4" of snow above. Ridgetop winds from the East are expected to bump up to the 20-25mph range before backing off this evening. Temperatures should stay warm through today, mid to upper-30's at sea level and around 30F at 1,000'. Starting tonight and into tomorrow, cooler Westerly flow will move in dropping temperatures and allowing the wet snow to begin to freeze up. Stay tuned!